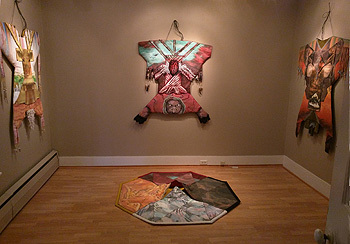 Current and recent artwork by mixed-media artist Alyssa Hinton—cxsilvergallery.com/alyssa-hinton—explores her indigenous heritage, especially her Tuscaroran ancestry. Her multiracial background reflects the hybrid quality of her art-making approaches to installation, sculpture, collage, assemblage, patchwork quilting, fiber appliqué, painting, drawing, block prints, photo-to-collage, and digital composite. Her exhibition and online book launch—magcloud.com/browse/issue/1254092—are hosted at C.X. Silver Gallery, 814 Western Ave., open daily by appointment; call in advance to arrange a visit, (802) 257-7898. Three years in the making, Alyssa's Earth Altar was inspired by Native American astronomy, cosmology, and earth spirituality as well as by traditional hide garments. 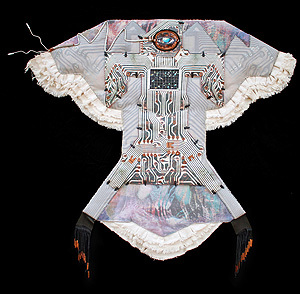 Symbolizing the revival of indigenous culture and the unity and interdependence between humans and the universe, the five pieces of the Altar are an octagonal medicine wheel encircled by four free-hanging "Power Dresses," wearable medicine wheels designed to show the horizon line between the earth and sky. On Tuesday, June 20, there will be a discussion with the artist at the Gallery from 5:00 to 7:00 p.m. Display of the Altar pieces concludes the next day, but Hinton's Ancestral Spaceship and Awakening series of 2-D and 3-D works continue through September 25. The Awakening series reflects her connection to, and reverence for, the natural environment and the mysteries of the cosmos, the artwork overall like visual soul as in soul music in visual form, and "a window through which we can look inward and outward at the same time." 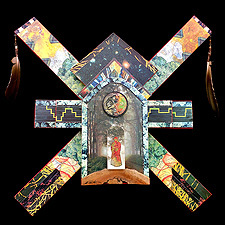 The Ancestral Spaceship mixed-media assemblage series includes imagery relating to the creation stories and ceremonial/seasonal cycles of her indigenous ancestors with a message of connectedness to the earth and being part of the universal dialogue of environmental responsibility. Alyssa attended The Putney School, founded by her grandmother Carmelita Hinton. Her great-great-grandfather was mathematician George Boole of Ireland, from whom we now have Boolean Algebra. 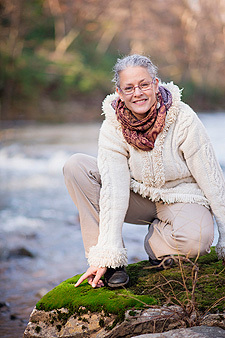 Her mother's side are of African and Native American ancestry; and Alyssa now lives in eastern North Carolina, a region linked to the Tuscarora nation that is historically connected to the Iroquoian confederacy, which inhabited the eastern United States for thousands of years. This and her art are the subject of the blog at alyssahinton.com.